I remember this salad being served in huge amounts in a gigantic salad bowl, with the shrimp layered on top, along with miniature biscuits stuffed with ham, and tiny creampuffs filled with whipped cream and strawberries for catered events at the University Hospitals in Augusta, Ga., where I worked in the 70’s. 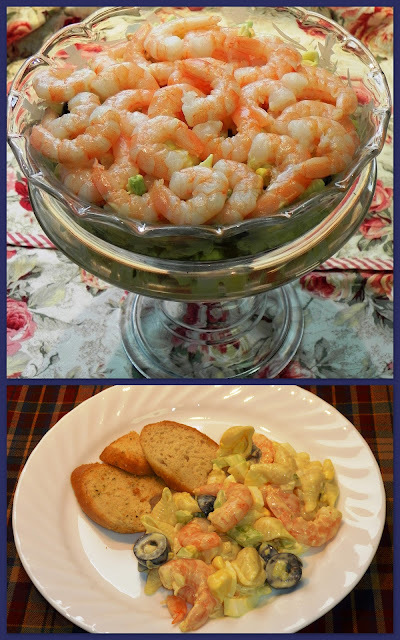 When the recipe says “shrimp and macaroni” they mean it – there is as much or more shrimp than macaroni. It’s a very simple salad, but delicious and pretty to serve. If about half of the shrimp is placed on top, it is picked up as it’s served. We personally like medium shells, but any small macaroni works. Combine all ingredients except shrimp. Mix well and place in covered dish to chill. About 30 minutes, stir in cooked shrimp and toss lightly. Serve from a lettuce lined salad bowl. Serves 10. "Southern Living Our Best Recipes vol 1 "
Per Serving: 297 Calories; 14g Fat (42.6% calories from fat); 24g Protein; 18g Carbohydrate; 1g Dietary Fiber; 248mg Cholesterol; 403mg Sodium. Exchanges: 1 Grain(Starch); 3 1/2 Lean Meat; 0 Vegetable; 0 Fruit; 1 Fat. Made this salad from Sue's recipe. What a hit in our family and with others. Great salad if you like shrimp. I used the 51 to 60 count with tails on. Took the tails off before using.